A new provision in the tax law for the first time in 2018 is leading to a frenzy of tax-driven investment products to be promoted to affluent investors, but caution is wise. Investors can defer paying tax on large capital gains or eliminate gains taxes entirely by investing in one of more than 8,000 places across the country designated under federal law as Opportunity Zones (OZ). 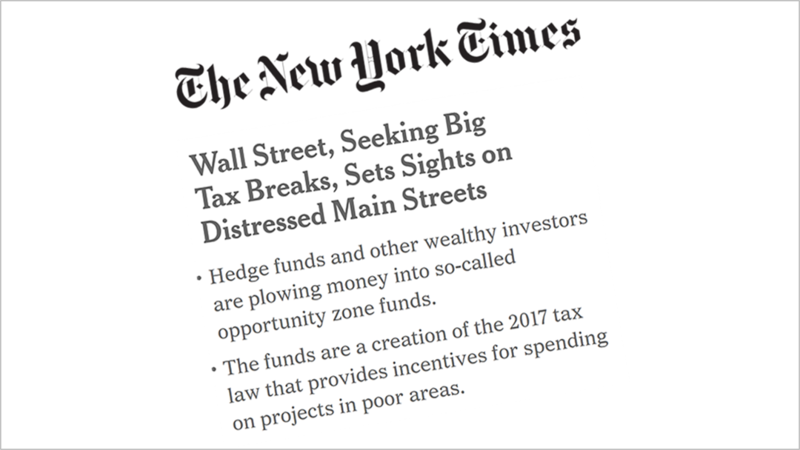 The lucrative new tax-driven investments are being promoted by Wall Street firms, which already has prompted warnings in the press about the sudden investment fascination. With an OZ investment, a reinvested capital gain is tax-deferred, putting an additional 15% or 20% more into your OZ investment. You don't have to pay the gains tax until you sell your interest in the opportunity zone investment. If you stay in the fund for five years, you pay tax on only 90% of your delayed capital gains. Hold for seven years, and you pay tax on 85% of the gains. And if you hold it for 10 years, the appreciation on the OZ investment is tax-free when you exit the fund — assuming the investment has increased in value. Since January 2018, more than 80 OZ funds have sprung up, even though the Trump administration has not finalized regulations governing them, according to a front-page story in The New York Times on February 20th, 2019. "Managers of the funds are seeking to raise huge sums of money by pitching investors on a combination of outsize returns and a feel-good role in fighting poverty." Some of these OZ areas are more down-and-out than others. Perhaps the most prominent OZ is Long Island City, a waterfront section of the New York borough of Queens. Amazon was set to build a new headquarters there but backed out after its large tax breaks stirred controversy. Other gentrifying OZs include Oakland, Calif.; East Austin, Texas; and South Norwalk, Conn, but thousands are located in seedy parts of downtowns across the country. The frenzy of activity is reminiscent of tax scams peddled after the enactment of major federal tax reforms in the 1980s and 1990s, which resulted in huge losses for investors and a plethora of class-action lawsuits against Wall Street firms and other promoters. Oz investing can be expensive, and you must be comfortable with the risk as well the social objectives of a fund before investing, and it requires personal tax planning and investment research from a professional. Please let us know if you have questions about this new type of investment that must be considered cautiously.